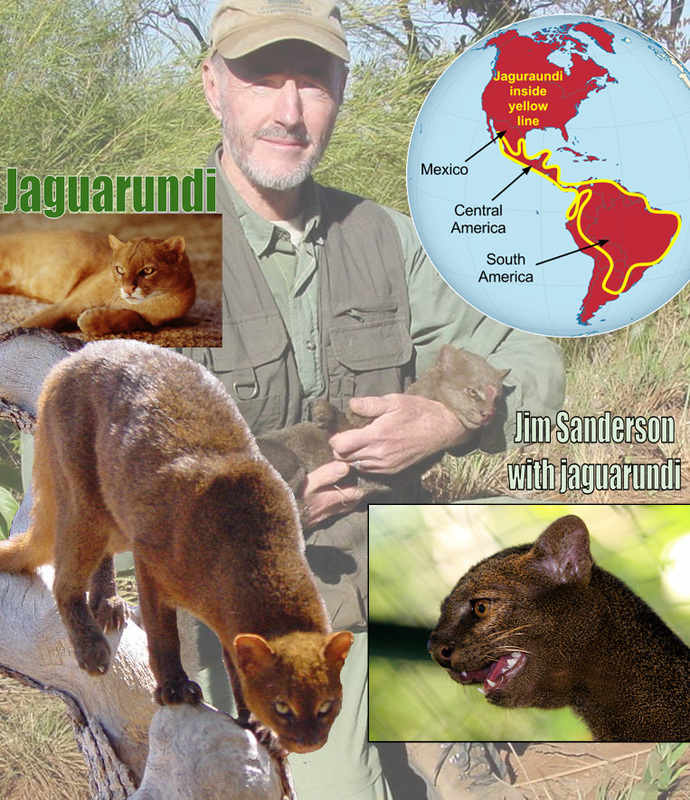 This is an illustrated page on jaguarundi facts for children and also people who like to read plain language. People can use the article if they wish. Everyone says that the jaguarundi is a strange looking cat. They are right but it is not that strange. The main reason why this small wild cat looks odd is because the head is small, the body is long and the fur is more or less a solid color rather than patterned. This is unusual for a small wild cat. The front legs are short but the rear legs are about normal length. The ears are small and the tail long. There are basically two colors: browny red and dark gray. The person in the picture below is Jim Sanderson. He knows the small wild cats very well indeed. He is an “expert” on small wild cats. He is carrying a jaguarundi. You can see the size very clearly in this picture. You can tell that the jaguarundi is about the size of a domestic cat weighing about 8 – 15 pounds or about 4 – 7 kilograms. Also from the map in the picture you can see that this small wild cat lives in Mexico, Central America and South America. Americans living in Florida also say they have seen this cat. Perhaps there are some in Florida and other parts of America such as Arizona and Texas. Some of these cats may be tame, domestic jaguarundis that have escaped. This is because they quickly become tame and are affectionate towards people. This may be because this cat is not hunted by people for its fur as the fur is not interesting enough. Three other small wild cats live in the same area as the jaguarundi. They are the ocelot, the margay and the oncilla. The jaguarundi likes to live in many different sorts of place but probably most likes forest and wet grassy areas near water such as rivers. There are more animals to eat in these areas and the forest hides the cat making it safer. This cat is a very good swimmer and climbs very well too. The long tail helps with balance when climbing trees. 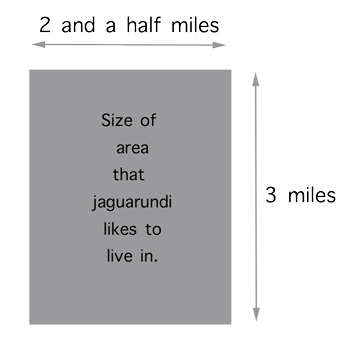 How Much Land Do Jaguarundis Need? The jaguarundi likes to have an area of about 7 – 8 square kilometers to live in. The picture below shows you how large this is. Even wild cats that are the size of a domestic cat need lots of space. The jagaurundi mainly eats small animals like rodents (rats for example), birds and reptiles (perhaps a lizard). Most of the animals it catches to eat weigh less than about 2 pounds or 1 kilogram. Sometimes they kill larger animals such as rabbits and even fish in ponds. They mainly search for animals to eat during daytime but they start early when the sun comes up. The jaguarundi makes lots of different sounds. They have more than 13 different calls. They purr like domestic cats, whistle, scream and chatter. They also make the sound of a bird. A chirping sound. The noises that two young jaguarundis made when they were fighting over dinner can be heard in the video below. You’ll be surprised at the noise they make but it shows you that although these cats can be tame and affectionate they are strong, wild cats. Mother jaguarundis normally have 2 babies each time they give birth. Mother is pregnant for 70 – 75 days. This small wild cat lives for about ten years in zoos. People don’t know how long they live in the wild. We don’t know. You probably won’t see one because they are spread out in the areas where they live. The total number of jaguarundis in the world is becoming smaller all the time. This is sad. It is because the forests that they like to live in are being chopped down. Also the grassy land is changed to farmland. It has less places to live in. Photostream of photographer of photo bottom right. Jim Sanderson’s website – Small Cat Conservation Alliance. Hi Juan, feel free to use the video. It was missing from this page due to technical reasons and I have added it back. It does highlight the extraordinary sounds that small wildcats make when being aggressive. The nose still shocks me! I’d appreciate it if you gave me, the website and the guy who did the recordings Balazs Buzas a credit – thanks. You might be able to contact Mr Buzas direct. Google him and dig around a bit. I made the video years ago so I have forgotten his profession but I think he is a scientist. Thank you Michael, I am reaching Balaz to ask him about the sounds. I apreciate your help and your great job! Thanks for this but the page is inaccessible for some reason. Probably EU GDPR privacy rules. We live on the San Bernard River in Brazoria, Texas and myself and several neighbors have seen this cat around here. There have been many sightings mostly during daylight hours. One man did get a good picture and a Jaguarundi is exactly what we have been seeing. We also have numerous sightings of Cougars in this area. Are they dangerous to humans? Hi Linda. Thanks for your useful information. It is nice to hear of sightings. The jaguarundi is not meant to be in Texas according to the experts. The farthest north is on the east coast of Mexico. But the experts are not always correct! The same goes for the cougar. There are lots of sightings in the east of the USA where it is not meant to be. The jaguarundi is not dangerous to humans. They’ll run away unless cornered but that applies to any cat. If you can get a pictures it would be marvellous but it is unlikely that you’ll be able to. Thanks for sharing that experience, Julie. It is interesting that this wild cat is seen in Texas. Sometimes I think there is a population on Texas and Florida despite the fact that the experts say there are none. If you can get a picture please come back and show it to us. You can use the uploader.